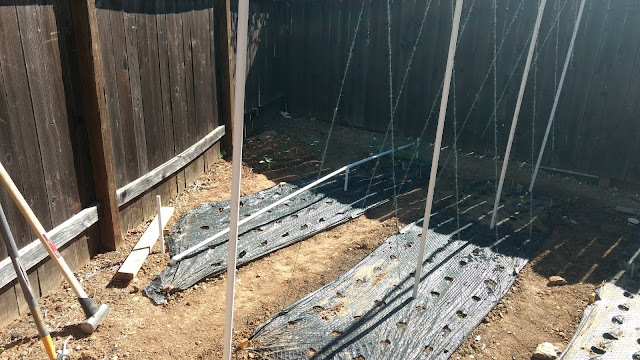 Once the tomatoes and peppers get established in the yard, they'll need some support. Since the spacing on all my plants is such where traditional tomato cages would not have enough space to be viable (and too costly), I thought of a more practical solution. 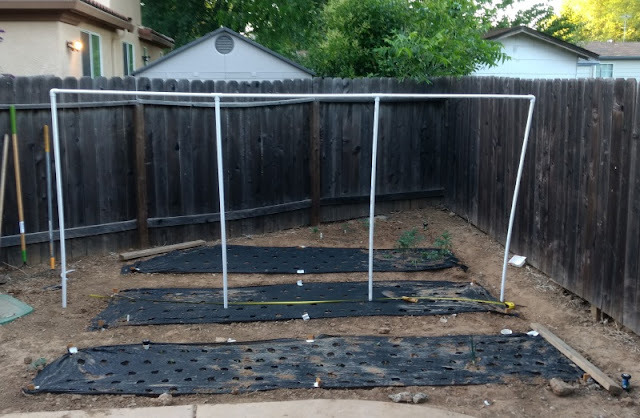 With rows only 11 feet long, and PVC pipe lengths being 10 feet, I set out to build a PVC trellis. Since the first field is more traditionally spaced, I opted to have 4 legs (6' tall) spaced at 4 feet apart on that one. The second field is constricted by the wall in the back, so 3 legs spaced out, one at 4' and the other at 6', worked perfectly. 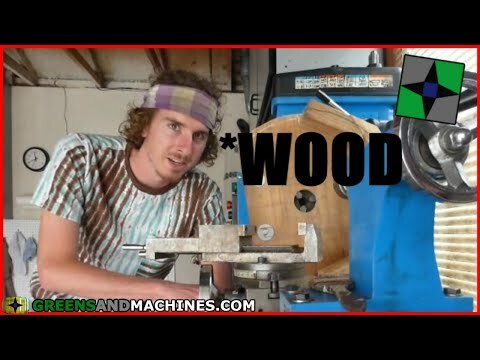 These dimensions also worked nice for the pipe; each piece gives a 6' and a 4' length when cut! Highly recommend investing in a PVC cutter. 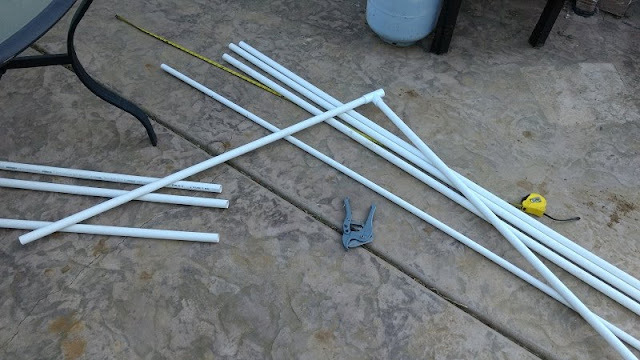 I'm using 3/4" diameter PVC for the structure of the trellis. 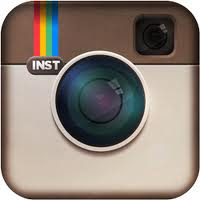 This pipe has a thinner wall diameter (sch 200?). To get the legs to stand up and to hold the pipe upright, I bought a length of 1/2" sch 40 PVC to use as stakes. With the thinner wall diameter, the 3/4" pipe slips right over the 1/2" pipe. I made 18" long stakes and hammered them into place with my trusty sledgehammer. 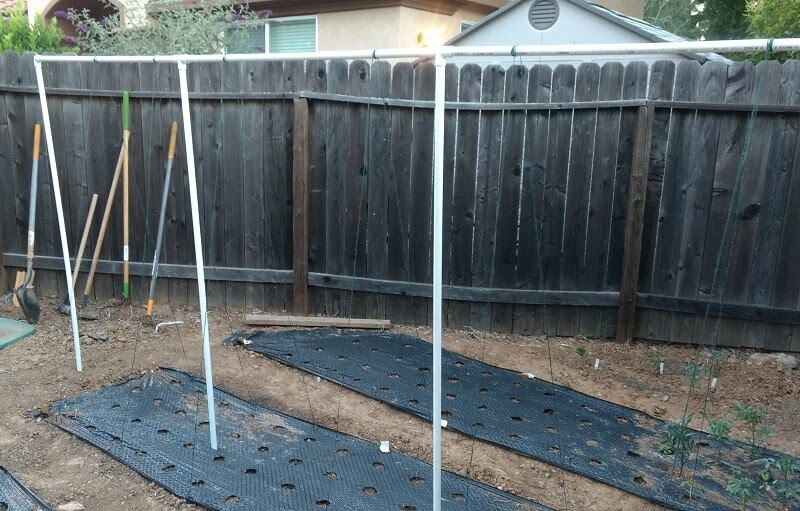 For the cross bars (the 4' lengths here), simple 3/4" elbow and tee fittings are enough to hang them high. Now with the structure erected, for training the plants, I bought a good length of jute twine to run atop the trellis. 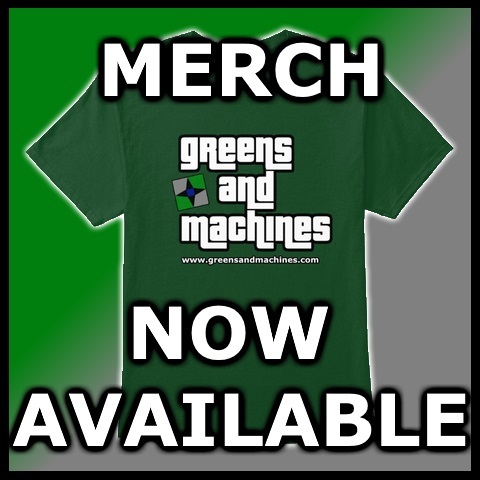 This is tied down to the landscape fabric staples that run along the sides of the fabric. 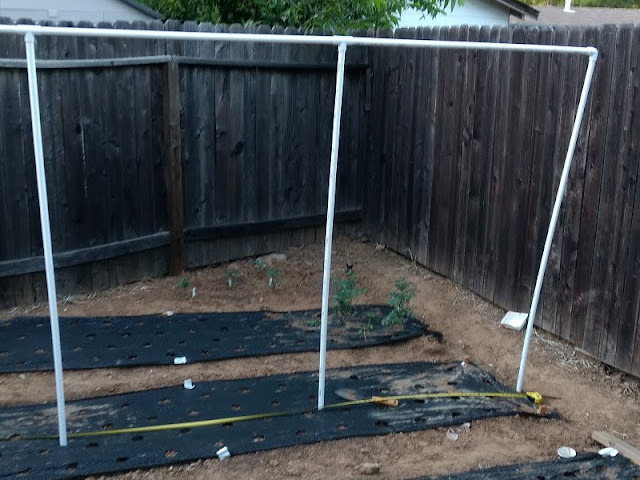 After being satisfied with the first trellis, I ran out to get more pipe for the second one. As I mentioned earlier, this one would have 3 legs, due to the irregular sized field. 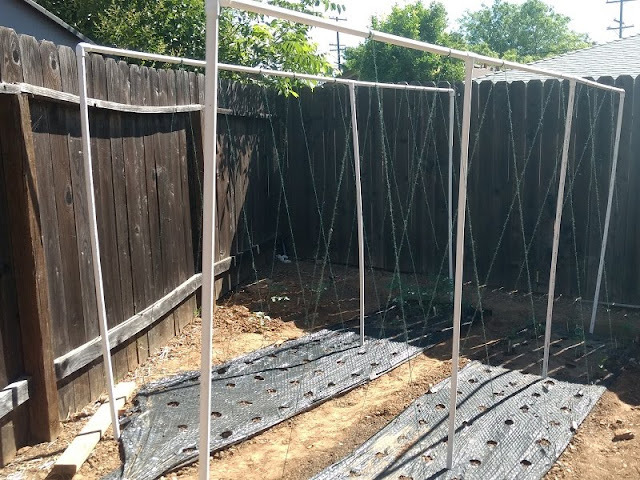 I put a lot more twine on this trellis as this field will eventually be filled with tomatoes. We shall see how well these trellises hold up to the weight of all the plants once they get growing!